Eoghan and Pat were amazing! What a great concert, followed by a top-notch session (our own Corey and Ted in attendance.) I’m really into the idea of the tonalities of various instruments and how they blend with one another. For awhile I was sure that fiddle + concertina = the best thing ever, but then I heard the Coen brothers, Jack and Fr. Charlie, on their album “The Branch Line” and I rethought that; the flute + concertina = the best thing ever, too, apparently. 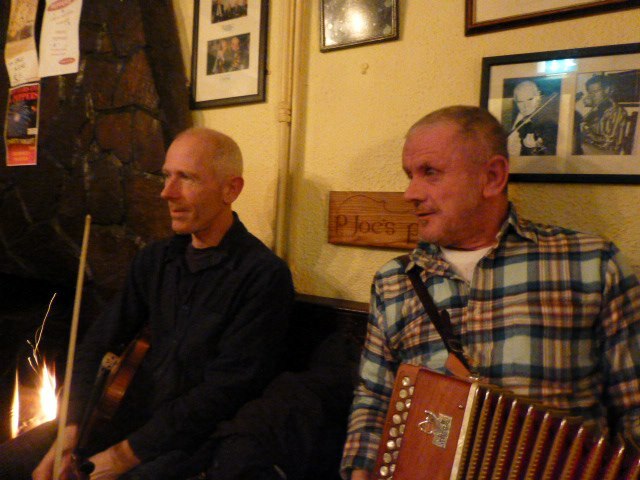 The list goes on from there–but back to the concert–Pat’s fiddle and Eoghan’s button accordion were a really great match, aligning perfectly through their spot-on playing to create one richly transformative sound. Eoghan also played the flute for a few sets, and since flute is one of my favorite instruments to listen to, it’s safe to say I was very happy. I spoke with Eoghan for awhile afterward–he’s a really pleasant guy, and even though he was obviously dead tired from jet lag, he tolerated me and my questions. Their CD was available for sale at the show, but I didn’t have the cash. Now I’m having trouble tracking it down. If anyone knows where one could get a copy please comment below. Amazing music in a beautiful setting – Please pass the word! The concert will be held at The Nacul Center for Ecological Architecture 592 Main St., Amherst, Massachusetts.